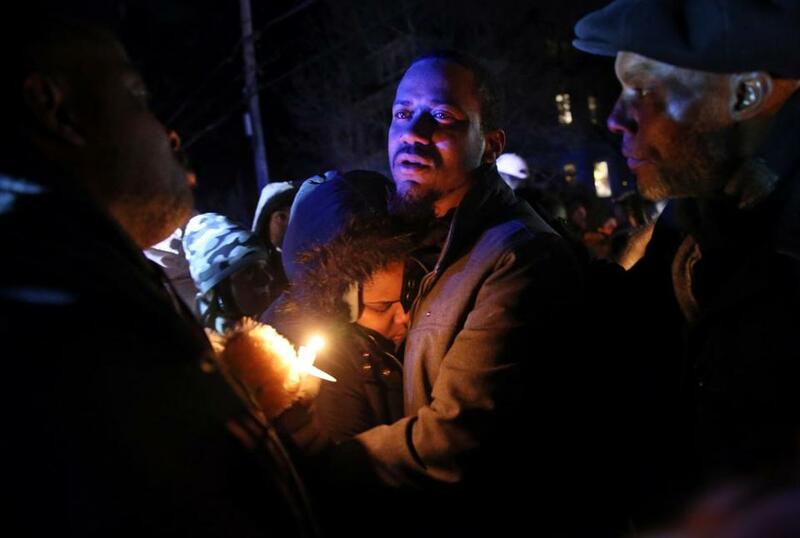 Edson Brito and his daughter Tamia embrace following a vigil in memory of his two sons, 8-year-old Edson Brito and 5-year-old Lason Brito, in Brockton on Thursday. Over one hundred Brockton community members gathered for a candlelight vigil Thursday night outside a Prospect Street home where a mother allegedly stabbed her two young boys to death earlier this week. Friends, classmates, and community leaders brought stuffed animals, balloons, and flowers to the home. 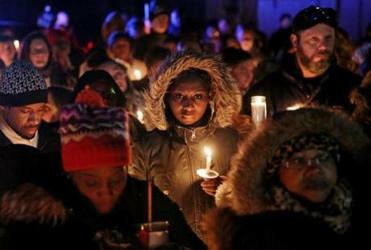 They sang songs of unity, lit candles, and pledged their support to the victims’ family. The bodies of 8-year-old Edson “Marlon” Brito and 5-year-old Lason Brito were found covered in stab wounds in the home Monday, and their mother, Latarsha L. Sanders, 43, was charged with their murder. A Brockton mother, like so many others, refused mental health treatment. Then, police say, she killed two of her children. The boys’ father and maternal grandmother also expressed dismay, and asked the public not to rush to judgment. Brito said the couple was married for 12 years. “I never knew her for practicing voodoo, or any of that,” Brito said, an apparent reference to the ritual practice cited by authorities. Shalea Sanders, 27, of one Latarsha’s two adult children held up a picture of her mother. The vigil, which started at 6 p.m., was organized by Ollie Spears, a local activist. Spears and other community leaders spoke of the need to address mental health. “We know mental health is a major, major problem in our community,” said City Councilor At-Large Moises Rodrigues . Rodrigues said they are establishing a scholarship in the name of the Brito boys.